This place is located in Bandung Cartil recreation place, Cimenyan, Bandung West Java. This place is the top hill of its place to enjoy sunset in Bandung. Bukit Moko (Moko Hills) is the best place to see sunset. People usually stay from sunset to midnight to see the beautifulness on the Bukit Moko. The place offers the restaurant called Warung Daweung which has the food price from Rp 5000,- to Rp 20.000,- depending on the food you order. You can also enjoy the city lights which you can enjoy from this hills. Before you enter this hills, you will also see the pine forest. When is the Good Time to visit Bandung? This place has the open hours for 24 hours if you want to do the camping, however Bukit Moko open from morning until 8 p.m. You can enjoy this place every day. It sometimes open at the afternoon only before the sunset comes. You just have to pay the ticket for Rp 15.000,- and you can also prepare the fee for buying food or you also have to prepare the fee for do the camping here start from Rp 10.000,-. There is a parking fee if you bring your own vehicle. The parking fee costs Rp 3.000,- to Rp 5000.- depending on the vehicle you bring to Bukit Moko. If you decide to visit this place soon, you can bring your own vehicle or your rent vehicle such as car or motorcycle. If you decide to bring your own vehicle than you can directly drive to Kampung Buntis Bongkor, approximately 15 kilometer-drive from Bandung city center. You can go to Cicaheum or Leuwi Panjang Bus Station from Bandung city center by public transportation or online public transportation. After you arrive at those station, you can order or rent the motorcycle and the cost starts from Rp 80.000.-. You can also go to Bukit Moko by public transportation from Jl. PH.H Mustofa and it needs three times move to one public transportation to another. As same as other bridges or flyovers around the world, Jembatan Pasupati is the road for the vehicle for passing through from Pasteur road and Surapati road. It has length for about 2.8 kilometers. When you visit this place in the afternoon, you can see the sunset if the climate is good. It is beautiful to enjoy the sunset in Bandung among thousands houses which you can be seen from this bridge. Jembatan Pasupati (Pasupati Bridge) has no ticket price because this is the public road to be passed through. Sometimes, some people stop by to see the sunset or just to take pictures at the side of the road. Therefore you have to be careful if you want to take picture here. You may ask the police and the officer if you want to enjoy the sunset and take pictures. The bridge opens every day for 24 hours. The location of the bridge is between Pasteur road and Surapati Road. The bridge functions to connect Bandung from north to west. The exact location of this bridge is at Jl. Layang Pasupati, Tamansari, Bandung, Wetan, Bandung city center, West Java. If you decide to go through this bridge, you can directly go to this location by motorcycle, car or tour bus. Situ Cileunca or Cileunca Lake is the recreation place which offers some good views of the lake. The lake shows some beauty when it comes for sunrise and sunset. 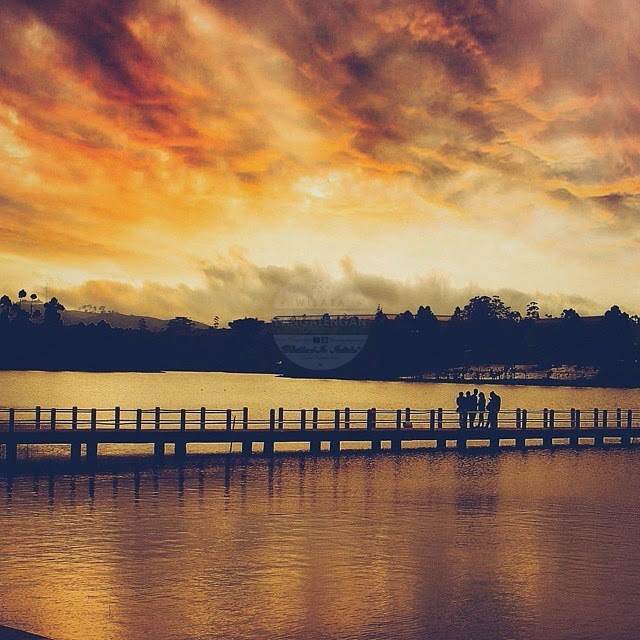 Some people often take pictures on the bridge on the lake called Love Bridge (Jembatan Cinta). 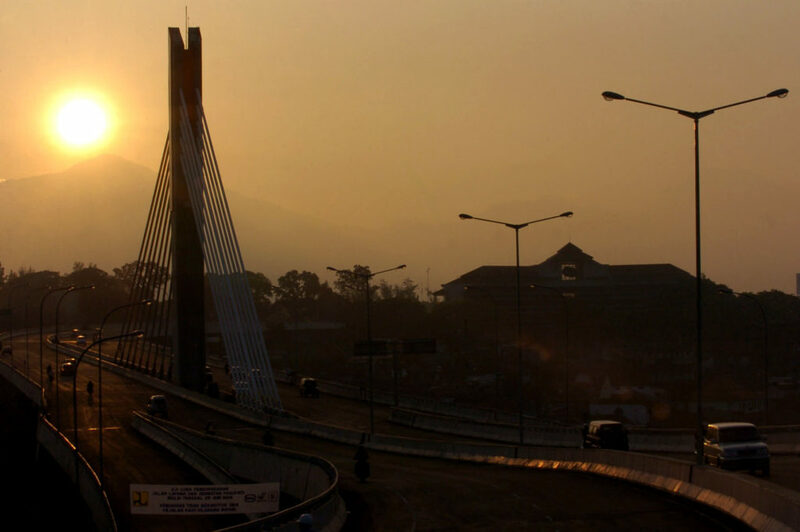 You can clearly enjoy the sunset in Bandung along this bridge and you can spend with your loved ones. The ticket price of this recreation place is from Rp 2.500 to Rp 5000,- and for the parking fee starts from 4.000,- to Rp 12.000,-. You may need to spare the fee for enjoying the lake and the sunset on the boat and it costs Rp 75.000,- for 10 people inside. The open hours of this lake recreation place is from morning to morning it means every day and every time you come here.